The Soldier River Barb is a native Thailand freshwater species which is distributed throughout South East Asia in Cambodia, Vietnam, Indonesia, Laos,Malaysia and Thailand where it is found throughout the Mekong basin and surrounding areas. 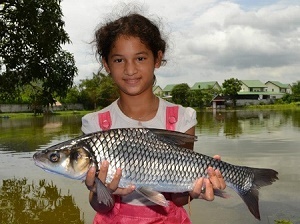 The Soldier River Barb has been described as being Cambodia’s most economically important freshwater fish species which is part of a staple diet for many riverside communities. The Soldier River Barb is another member of the Cyprinidae family of fishes (carp and minnows) which feed on a diet of zooplankton, molluscs, algae, small fishes and insects. Soldier River Barb are capable of growing to 75cm’s in length and have been recorded at weights approaching 3.5 kg’s. This beautiful Thailand barb species has a streamlined body shape which is covered in silver scaling with large fins displaying colouration ranging between grey/black in mature fish to yellow in younger specimens. Typically this species migrates upstream to inundated floodplains to spawn before returning to the rivers in October to December. Although not a monster fish by Thailand’s standards the Soldier River Barb is a beautiful barb species which is always a welcome capture to anglers fishing in Thailand.